HERIOT’S and the Barbarians put on a show for the large crowd which gathered at Goldenacre last night to celebrate the 125th anniversary of both clubs – the Baa-Baas coming out on top comfortably with a number of pros showing their quality. The game was all but won by half-time, the Barbarians 45-19 up at that stage with Namibian international winger Chrysander Botha running the show with four tries in the first 40 minutes. Winger Colin Goudie did score two of his own over the course of the match for Heriot’s, including a cracker in the second half, but it was not enough for the hosts on their big day as they lost 97-31. Prior to the match the clubhouse was packed to the rafters for a celebratory lunch as heroes of Heriot’s and the select side from yesteryear rolled back the clock and remembered the good old days. 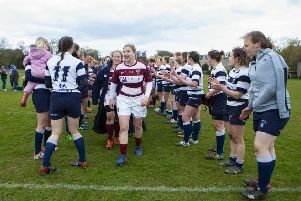 And, by the time old Heriot’s team mates Stewart Mustard and Gordon Ross – the latter given the honour of captaining the select side on his return to where it all began for him – led out the teams a great crowd had built up in the early evening sunshine. The Baa-Baas have been known over the years for their running rugby and after they had gone close down the left wing only for a forward pass to scupper things, they took the lead after two minutes. Centre Aled Thomas of Gloucester ghosted past his opposite man Max Learmonth and then gave a lovely inside pass to winger Botha who did the rest. Full-back James Pritchard added the extras. Heriot’s wanted to get back into things as quickly as they could and in the ninth minute they had their first chance. Centre Liam Steele, full-back Charlie Simpson and second-row Russell Nimmo all combined well on the left wing, but in the end the latter two fumbled with the ball and it was eventually knocked on. Two minutes later the “visitors” doubled their lead when that man Botha eased over for his second try of the match with Thomas the man to convert this time. Heriot’s got themselves on the scoresheet in the 13th minute when centre Learmonth did well to poach an interception and run in from nearly 30 metres out. Scrum-half Graham Wilson, always reliable with the boot, converted and it was game on. The tries just kept on coming and, three minutes later, Botha, the 26-year-old who has 29 caps for his country and who is on the books at Exeter Chiefs down south, completed his hat-trick. The try owed much to the good vision of Botha’s fellow winger Joshua Adams, but it went unconverted. The first quarter of this end-to-end encounter came to an end with the fifth try being scored, Goudie this time the man to benefit from an interception as he went in at the corner for Heriot’s. The Baa-Baas next one came, this time not for Botha, but for Adams of the Scarlets and, when Pritchard scored number five, it was 33-12 as the half-hour mark came and went. Two more tries came the Barbarians’ way before the break – Botha getting his fourth and Edinburgh scrum-half Grayson Hart crossing – before the biggest cheer of the half came when Heriot’s second-row Jamie Syme crashed over under the posts and it was 45-19 at the interval. Heriot’s would have been looking to get off to a good start in the second half, but that did not materialise. Instead the Baa-Baas broke through Botha and, when he was stopped in his tracks, he flipped an inside pass to Scotland cap Scott MacLeod, now with Newcastle, who dived over. Heriot’s fourth try did come soon after through Goudie, a stalwart of the current Goldenacre side, who showed his pace before a nice chip, chase and gather to score his second. Back-row Chris Jones went over before Adams completed his hat-trick and then replacement scrum-half Ali Price, the talented Glasgow Warrior, joined the party. The Baa-Baas then edged ever closer to the century mark, replacement back Aled Summerhill the tryscorer this time with Ross converting, and it was 92-31. Replacement prop Titi Lamositele then rounded things off with the match’s 20th try as it ended 97-31. Scorers: Heriot’s – Tries: Learmonth, Goudie 2, Syme, Mulligan. Cons: Wilson 2, Mustard. Barbarians – Tries: Botha 4, Adams 3, Pritchard, Hart, MacLeod, Thomas, Jones, Price, Summerhill, Lamositele. Cons: Prichard 6, Thomas 4, Ross. Heriot’s: C Simpson; H Boisseau, L Steele, M Learmonth, C Goudie; S Edwards, G Wilson; N Borel, S Mustard, S Cessford, R Nimmo, J Syme, J Ritchie, J Hill, J McLean. Subs used: D McGregor, JP Ward, B Cogley, C Mulligan, D Sommerville, G McNeish, K Buchan, D McMaster, J Turley. Barbarians: J Pritchard; C Botha, S Naqelevuki, A Thomas, J Adams; G Ross, G Hart; A Croall, M Mayhew, B Douglas, S MacLeod, K Low, C Morgan, C Jones, M Hankin. Subs used: N Cochrane, A Brown, T Lamositele, L McGlone, J Eddie, A Price, I McKinley, A Summerhill.